Donald Trump Jr has said he’ll cooperate with the Senate Intelligence Committee after confirming the meeting took place. Donald Trump Jr. campaigns for his father days before the election in November last year. DONALD TRUMP’S ELDEST son said he met with a Kremlin-linked lawyer shortly after his father clinched the Republican nomination, hoping to get information helpful to the campaign. 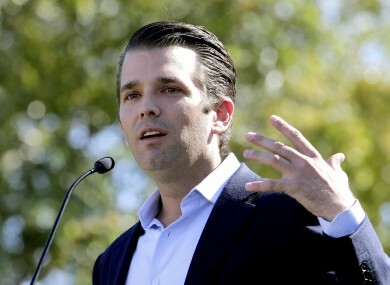 A New York Times report yesterday citing advisers to the White House briefed on the encounter said Donald Trump Jr agreed to the meeting after being promised information damaging to Hillary Clinton. In a series of tweets today, Donald Trump Jr rejected claims that there was inconsistency in statements he has given on the matter and said that he would work with the Senate Intelligence Committee to “pass on” what he knows. He said “obviously I’m the first person on a campaign to ever take a meeting to hear info about an opponent… went nowhere but had to listen”. Trump Jr has also hired a New York-based lawyer to represent him in this matter. Alan Futerfas confirmed in an email to The Associated Press today that he’s the lawyer for Donald Trump Jr. The Senate Intelligence Committee’s top Democrat says he “absolutely” wants to hear from President Donald Trump’s eldest son about his meeting with the Russian lawer. Virginia Senator Mark Warner said: “This is the first time that the public has seen clear evidence of senior-level members of the Trump campaign meeting with Russians” to obtain information damaging to Clinton. The June meeting at Trump Tower with attorney Natalia Veselnitskaya involved Trump Jr, his brother-in-law Jared Kushner and Paul Manafort, who was then the campaign chairman. The existence of the meeting was disclosed only recently to government officials and confirmed at the weekend by representatives of Trump Jr and Kushner following a separate Times report. In a statement yesterday, Trump Jr did not confirm that the information he was promised would be damaging to Clinton. But he said he was asked by an acquaintance he knew from the 2013 Miss Universe pageant to have a meeting with a person he was told might have information that would be helpful to the Trump campaign. He said he was not told the name of the person before the meeting. Trump Jr said that during the meeting the attorney claimed to have information that “individuals connected to Russia were funding the Democratic National Committee” and supporting Clinton. He said no details or supporting information was ever offered, and that his father was unaware of the meeting. On Saturday, Trump Jr had described the same gathering as a “short introductory meeting” during which the three discussed a disbanded programme that used to allow US citizens to adopt Russian children. Russia ended the adoptions in response to American sanctions brought against the nation following the 2009 death of an imprisoned lawyer who spoke about a corruption scandal. He said yesterday that the attorney turned the conversation to the adoption of Russian children, and that he believed that this was the “true agenda” of the meeting and that claims about having information helpful to the Trump campaign had been a pretext for the encounter. “I interrupted and advised her that my father was not an elected official, but rather a private citizen, and that her comments and concerns were better addressed if and when he held public office,” Trump Jr said in the statement. Unlike Kushner, Trump Jr does not serve in the administration and is not required to disclose his foreign contacts. The newspaper said the meeting was disclosed in recent days to government investigators when he filed a revised version of a form needed to obtain a security clearance. His attorney has previously acknowledged that Kushner’s first security clearance submission was incomplete. Email “'It went nowhere but I had to listen': Trump Jr met Russian lawyer for information on Hillary Clinton”. Feedback on “'It went nowhere but I had to listen': Trump Jr met Russian lawyer for information on Hillary Clinton”.